Our team strives daily to provide compassion, peace of mind and the highest quality care there that is possible. We are humbled and grateful to receive this award, which helps to validate our efforts. 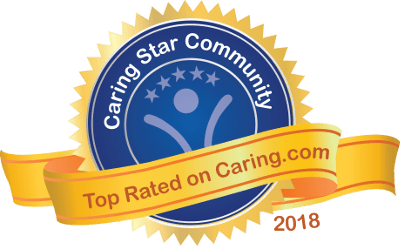 On behalf of our community team, thank you to everyone who took the time to share their positive feedback with us and to Caring.com for recognizing us as a Caring Star of 2018. Online reviews help Americans research and select the best senior care providers for aging or ailing loved ones. In multiple Caring.com research studies, the majority of family caregivers have indicated that they turn to the Internet and consumer reviews when narrowing their options among senior living communities in their area, and have relied on these perspectives as much as or more so than in-person recommendations from geriatric professionals or medical personnel. Now entering its seventh year, the Caring Stars annual list helps consumers see which senior living communities are top rated by other families just like theirs – which is particularly helpful as families gather for the holidays and discover increased or urgent senior care needs for their parents or grandparents. "Congratulations to Pacifica Senior Living: Riverside Legacies Memory Care for achieving this award after earning accolades from residents and their loved ones on Caring.com," said Karen Cassel, Caring.com CEO. "This important milestone speaks volumes about the positive difference Pacifica Senior Living: Riverside Legacies Memory Care is making in serving older adults, and we join with the local community in celebrating their accomplishment." Privately owned, Pacifica Senior Living strives to create a lifestyle of independence and peace of mind for each individual and their family. We do what we love and what we truly believe in – providing compassionate, personalized care services with dignity and respect. Our dedicated, professional team supports each resident and goes beyond to help them feel at home.